“To refuse the obligations of international leadership for the sake of some half-baked, spurious nationalism cooked up by people who would rather find scapegoats than solve problems is unpatriotic.” — Senator John S. McCain III (R-AZ). U.S. Republican presidential nominee Senator John McCain (R-AZ) listens as he is being introduced at a campaign rally in Denver, Colorado, October 24, 2008. Photo: REUTERS/ REUTERS/Brian Snyder. Courtesy HBO. Screening update: To honor the legacy of Senator John S. McCain, who passed away on August 25, 2018, HBO has scheduled Encore screenings to commence on what would have been his 82nd birthday, Wednesday, August 29, 2018, 8:00 – 9:45 p.m. Additional screenings will air on Friday, August 31, and Saturday, September 1, 2018. Check air times in your region. Filmed in Washington, D.C., and at Senator McCain’s bucolic home in Sedona, Arizona, after his diagnosis with brain cancer, John McCain: For Whom the Bell Tolls is titled not for McCain’s dire medical prognosis but for his favorite book, Hemingway’s For Whom the Bell Tolls. He became transfixed by the novel at age 12, and continues to hold its protagonist, Robert Jordan, the champion of lost causes, close to his heart as a role model. 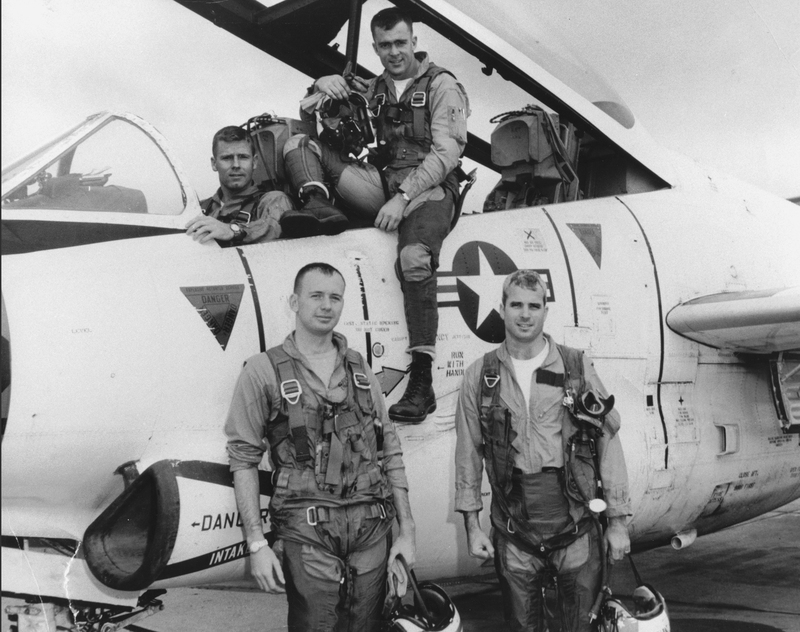 Naval pilot John McCain (right) with his squadron and T-2 Buckeye trainer, circa 1965. Photo courtesy HBO. As colleagues, friends and family members (even his forgiving first wife, Carol, who admits to being “blindsided” when her husband ditched her for a younger woman) share personal and professional anecdotes about the man they obviously love to love, it’s clear that Senator McCain’s positive legacy as an American hero and patriot is the focus here. Senator McCain admits throughout the film to more than a few regrets. He seriously considered naming his friend and colleague, Joe Lieberman, as his running mate in his 2008 presidential campaign but was convinced otherwise…enter Sarah Palin. He lacked scholarly focus as a student at the United States Naval Academy (Annapolis). And he owns up to some self-described “imperfect service” during his more than 30-year stint as a U.S. representative and senator. To my mind, Senator McCain’s challenges to Donald Trump’s candidacy and presidency were much too slow getting out of the gate. I always believed that had he taken a strong stand against Trump’s distressing 2016 campaign behavior and confronted Trump’s disrespectful mockery of his 5-1/2 year incarceration as a POW during the Vietnam War, John McCain could have sent Donald Trump packing long before election day. McCain’s silence was deafening, or so it seemed to me. 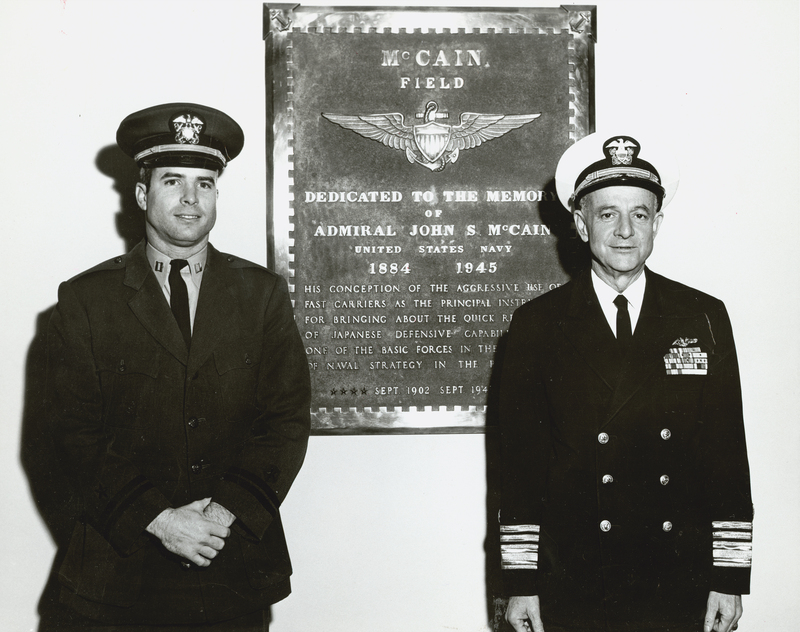 John McCain (left) standing with his father, Admiral John S. McCain, Jr. (right) in front of a plaque dedicated to Senator McCain’s grandfather, Admiral John McCain, Sr. Photo courtesy the McCain Family/HBO. But that’s water under the bridge. Senator McCain has become one of President Trump’s worst nightmares and the standard-bearer for everything that Trump is not and never will be… the son and grandson of distinguished Naval officers (his elders were the first father-son admirals in U.S. Naval history); a graduate of Annapolis and a Navy fighter pilot who served in the U.S. military with distinction (1958-1981); a survivor of torture and lifelong disabilities inflicted during his 5-1/2 year incarceration as a POW during the Vietnam War; and a U.S. representative and senator for more than 30 years who has respected the tenets of the U.S. Constitution and advocated, in word and deed, the importance of bipartisanship. 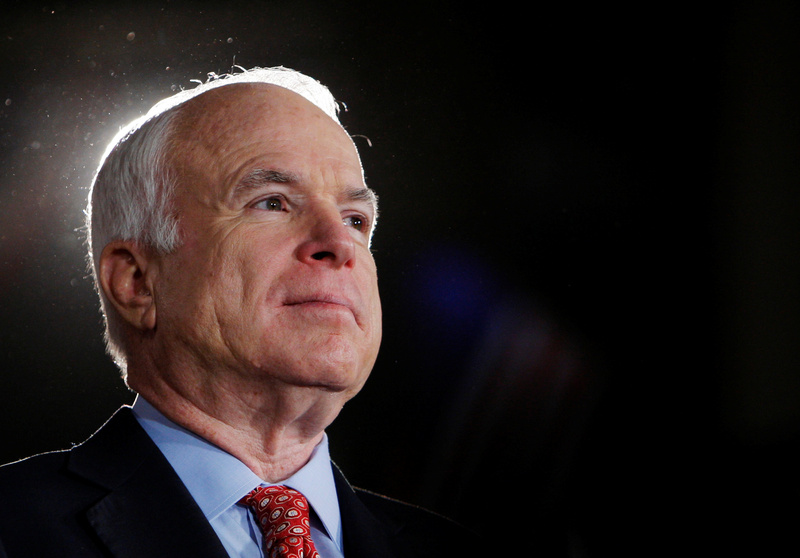 Now, as he fights his daunting battle with aggressive brain cancer, Senator John McCain has resurfaced in the public eye as an American patriot who we are assured has always had a strong moral compass when it matters most and has never had a problem confronting “lost causes” head on, persevering and crossing the aisle to get the job done. 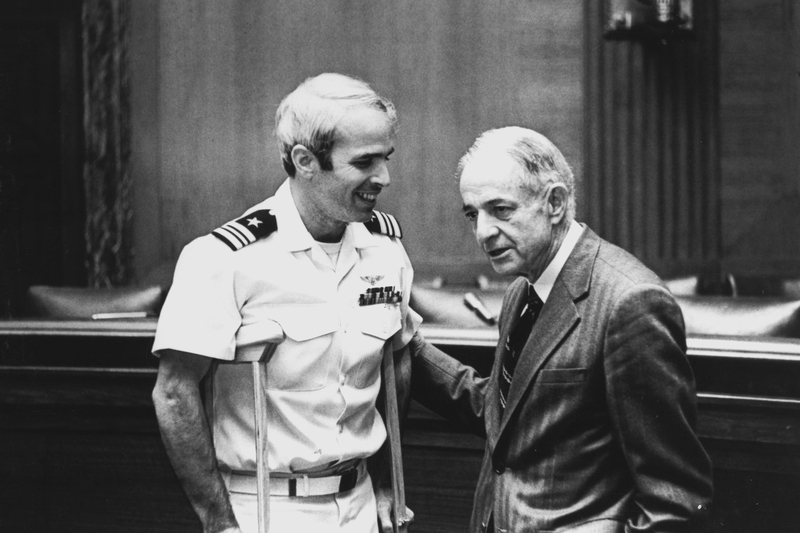 Navy pilot John McCain (left) with his father, Admiral John S. McCain, Jr. (right), after the former was released from a North Vietnamese prison camp in 1973. Photo courtesy HBO. As Memorial Day 2018 draws to a close, what better time to become reacquainted with the “better angels” populating our military and political landscape… those resilient patriots who continue to serve with distinction and defend the American ideals for which our forefathers fought and died. This entry was posted in Cable, Film, Politics and tagged For Whom the Bell Tolls, George Kunhardt, HBO, Peter Kunhardt, Politicians, Senator John S. McCain III, Teddy Kunhardt, The Restless Wave, U.S. Navy, Vietnam War. Bookmark the permalink. Judy wasn’t able to see Memorial Day weekend but will definitely keep my eye out for it. Your synopsis of the documentary moved me and couldn’t agree with u more.